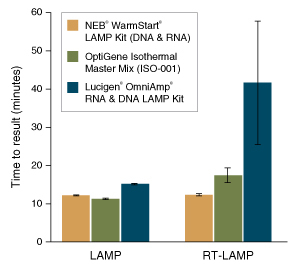 The WarmStart LAMP Kit (DNA & RNA) is designed to provide a simple, one-step solution for Loop-Mediated Isothermal Amplification (LAMP) of DNA or RNA (RT-LAMP) targets. 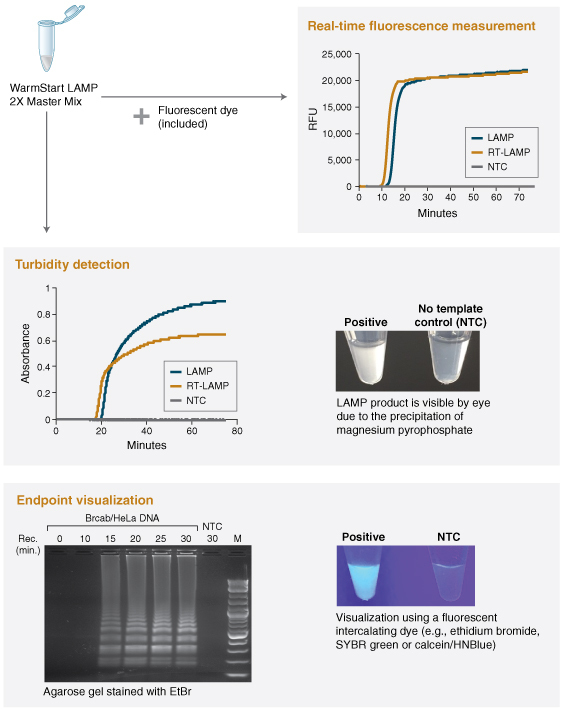 LAMP and RT-LAMP are commonly used isothermal amplification techniques that provides rapid detection of a target nucleic acid using LAMP-specific primers (supplied by the user) and a strand-displacing DNA polymerase. This kit is supplied with the WarmStart LAMP 2X Master Mix, which contains a blend of Bst 2.0 WarmStart DNA Polymerase and WarmStart RTx Reverse Transcriptase in an optimized LAMP buffer solution. Both Bst 2.0 WarmStart DNA Polymerase and WarmStart RTx Reverse Transcriptase have been engineered for improved performance in LAMP and RT-LAMP reactions. A fluorescent dye is also supplied to enable real-time fluorescence measurement of LAMP. The WarmStart LAMP Kit is compatible with multiple detection methods, including turbidity detection, real-time fluorescence detection (when used with LAMP fluorescent dye) and end-point visualization. The NEB WarmStart LAMP Kit (DNA & RNA) includes separate fluorescent dye for real-time fluorescence measurement. Alternately, detection can be accomplished by turbidity detection or endpoint visualization. 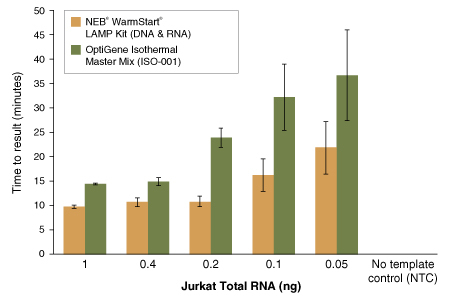 A RNA target (HMBS2) was amplified from Jurkat total RNA using the WarmStart LAMP Kit and OptiGene Master Mix (ISO-001). Reactions were performed at 65°C for 74 minutes on a real-time thermocycler (Bio-Rad CFX96) in triplicate. Time to result is set as the time at which the fluorescence crossed a threshold of 10% of maximal fluorescence. NEB’s WarmStart LAMP Kit resulted in faster and more robust detection as compared to the OptiGene Master Mix. Experiments were designed to amplify a DNA target (BRCAb) and a RNA target (HMBS2) by LAMP or RT-LAMP, respectively. A 25 μl reaction containing 10 ng HeLa DNA or 5 ng Jurkat total RNA, 1X Master Mix, 1X LAMP primers and fluorescent dye was incubated on a Bio-Rad CFX98 instrument at 65°C for 75 minutes. Lucigen® OmniAmp® RNA & DNA Kit and OptiGene Isothermal Master Mix (ISO-001 ) were run according to manufacturers’ recommendations. In each individual reaction, multiple gDNA templates were added along with primers specific to a target in only one species. Reactions were incubated at 65°C for 74 minutes on a thermocycler (Bio-Rad CFX96) in triplicate. Positive results (+) were observed only in the expected species/target combinations, demonstrating high specificity of the WarmStart LAMP reactions. Nagamine, K., et al. (2001). Clin. Chem. 47, 1742-1743. Nagamine, K., Hase, T., Notomi, T. (2002). Mol. Cell Probes. 16, 223-229. Mori, Y., Nagamine, K., Tomita, N., Notomi, T. (2001). Biochem. Biophys. Res. Commun. 289, 150-154. Mori, Y., Kitao, M., Tomita, N., Notomi, T. (2004). J. Biochem. Biophys. Methods. 59, 145-157. Tomita, N., Mori, Y., Kanda, H., Notomi, T. (2008). Nat. Protoc. 3, 877-882. Tanner, N.A. and Evans, T. C. Jr (2014). Curr. Protoc. Mol. Biol. 105, Unit 15.14. Hsieh et al. (2014). Chem. Comm. 50, 3747-3749. Tanner, N.A., Zhang, Y. and Evans, T.C. Jr (2015). Biotechniques. 58, 59-68. What components are included in the kit, and which typical LAMP detection methods can be used? What is the optimal LAMP amplification temperature using this kit? What is the Mg++ concentration in the WarmStart LAMP Master Mix? How do I use the fluorescent dye? What DNA or RNA preparation method is required? How fast should I expect a result? How do I confirm a positive result? Can I set up my reaction at room temperature? What advantages does LAMP offer over PCR? How can I see the products of a LAMP reaction? Can I use dUTP and UDG for carryover contamination prevention with the WarmStart LAMP Master Mix?